Southampton Bed and Breakfast in Southampton - Acacia Lodge Guest House Bed and Breakfast in Southampton, UK: cacia Lodge Guest House has a four Diamond RAC Rating. Acacia Lodge is a family run guest house situated very close to Southampton City Centre,The River Hamble & The Hampshire Cricket Ground Just off Junction 8 of the M27. 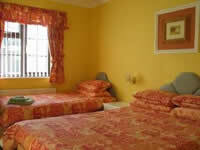 It has nine letting rooms all with en-suite,colour television &tea 7 coffee making facilities. Southampton is an attractive, multicultural city on England's South Coast, approximately 70 miles south west of London. More than 200,000 people live in the Southampton area and the city has opened its doors to several high profile commercial institutions. Steeped in a rich and varied heritage, Southampton is famous for a number of historic events; Henry V sailed for Agincourt, the Pilgrim Fathers sailed to America and the Titanic sailed on it's maiden voyage from Southampton. There is a selection of excellent museums, art galleries, shopping facilities, glorious parks, diverse entertainment and leisure facilities. Southampton Common annually hosts a balloon festival, flower show and the popular extravaganza, "Power in the Park" It is the perfect base from which to explore Hampshire. The nearby New Forest covers 145 square miles of open heath and woodland, picture postcard villages are dotted all around and it is not uncommon to encounter the occasional "New Forest" pony wandering around the more rural villages. Winchester, the ancient capital of England is 12 miles to the north whilst historic Salisbury is 30 miles north west. Both are a short journey away. Beaulieu Abbey, founded by Cistercian monks in 1204, offers a truly fascinating day out. Entertainment comes in various forms, from opera, ballet and theatre on international and local levels, smart restaurants waterside cafes and bars, tiny trattorias and bistros, multi screen cinemas and nightclubs. The famous Mayflower Theatre is the region's principal venue and most of London's West End shows can be enjoyed here; classical and jazz ensembles can be enjoyed at the Turner Simms Concert Hall whilst rock concerts are frequent attractions at the Guildhall. Many take advantage of the open air festivals held throughout the summer. Communications are excellent. Southampton is easily accessible by road, rail, sea and air. The M3 and M27 motorways allow fast and easy access to London and all major cities. The train station in central Southampton provides direct services to London, Basingstoke, Winchester, Southampton Airport, Bournemouth, Poole, Portsmouth, Bath, Bristol, Cardiff and Gatwick Airport. Several bus companies and reputable taxi services operate within Southampton and the surrounding area. Southampton boasts some of the best sporting and leisure centres in the region. Health clubs, gymnasiums, swimming pools, tennis clubs, sailing, windsurfing, canoeing, rock climbing, gliding, mountaineering, golf, cricket, football, rugby, squash, horse riding...... the list is endless. Water enthusiasts can enjoy a selection of outdoor pursuits and whether you are a beginner or an experienced sailor, you can take advantage of a range of offshore sailing courses. Some of the world's most important maritime events are based in Southampton including the prestigious Round the World Race and more than 100,000 people flock to the annual International Boat Show. Located on natural wooded hills, the Southampton Ski Centre offers three dry ski runs and has established itself as one of the South Coast's premier attractions.